Plasmatech PTFE hand valves are ideally suited for use with ultra pure and difficult to handle liquids and gases. All parts are precision machined form virgin PTFE. Fittings nuts and cross member of valve stem are injection molded of Ryton R4. They are easily installed into your systems and function with the highest degree of reliability. Many combinations of tube or pipe connections are available, 1/8″ to 1/2″ NPT and 1/8″ to 3/4″ or 3mm to 19mm tube O.D. All configurations for connection with straight tube O.D.’s are supplied with Plasmatech fittings, female NPT ports are reinforced with anodized aluminum retaining collars. Only 3-4 turns are needed from closed to full open position. These valves do not require any stem packing. Maximum flow deflection with any style valve is 90º. The valve stem is removable for cleaning. Positive Pressure: To 80 psi Typical ¼” tube connection. Note: Plasmatech PTFE Hand Valves are available in many combinations. 2mm to 12mm orifice sizes may be ordered. Series 60 & 61 are machined with Plasmatech fittings in tube sizes from 1/8 ” to 3/4″ and 3mm to 19mm. 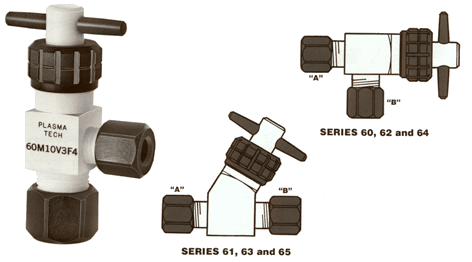 Series 62, 63, 64 & 65 are available in 1/8″ to 1/2″ NPT, or any combination of the above including NPT and tube connections on the same valve. Straight through valve with female NPT ports. A number of size and style combinations are stock items and Plasmatech is able to produce all possible combinations within the range of this design. Please inquire or order using the above reference chart.